The year was 1967, and like all nearly 17-year-old daydream believers, I thought anything was possible. 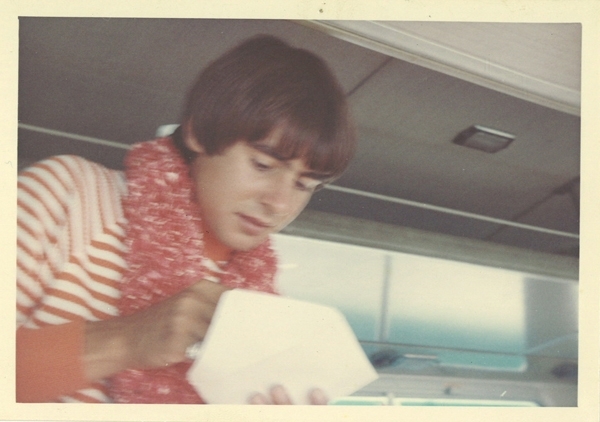 Take, for example, a contest running on my favorite Louisville radio station: "Win a Day with Davy Jones." Twenty-five words or less why you wanted to fly to Hollywood for a dream date with the Monkees' main squeeze. How hard could it be? Nobody could resist the group’s hummable hits or the wacky camp of their eponymous television show. And if some compared them unfavorably to the Beatles (the “Pre-Fab Four,” they’d called them for their assemblage for TV), Davy’s rich, theatrical baritone was one of the most distinctive voices of the era. Bottom line, though, it was The Face – equal parts angel, imp, and brooding romantic – that beckoned the girls and made them cry. There was, however, one small glitch: I'd interviewed Ken Douglas, the DJ who promoted the contest, for my high school paper. If I won, all my friends would say he gave it to me. And so I signed the entry forms with a fake name, Stephanie Johns (it sounded vaguely literary), and used the address of my best friend. Who would know? Ten entries later, I laid on my parents' couch with my turquoise transistor radio pressed to my ear as Ken announced the winner's name on the air. "And the lucky girl is…" he teased, pausing for dramatic effect. "Stephanie Johns," I said out loud. "Stephanie Johns!" Ken echoed through the tiny speaker. Oh, holy God. I'm a Believer. That June, I ironed my hair, threw on my groovy brown-and-white striped mini-dress, stepped into my white fishnet stockings, and boarded the plane for LAX with Ken and my mother as chaperones. When we landed, I tried to hide my excitement. But somewhere over Nebraska, I'd started to fantasize. Davy might actually like me. He might really, really like me! 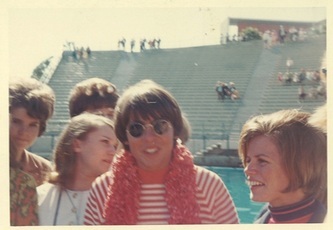 But wait, who were all these other girls standing under the "Davy Jones" banner with their mothers? It was then that I realized the ugly truth. The "winner" was A Little Bit Me, A Little Bit You. It was a group date, not a groupie date. Girls were there from everywhere – Miami, Cleveland, even Toronto. Twenty-three of us, each one thinking she was THE ONE, and giving all the others the evil eye. It was at the International Hotel that we got our first look at our mop-topped host. He had the teen idol dreaminess, all right, but 21-year-old Davy, whose early ambition was to be a jockey, was, at five-feet-three, even shorter than I imagined. As we all crowded around him in the lobby, I angled in to get a closer look, and stared down into the crown of his chestnut-colored head. He wore a red-and-white striped jersey, and for reasons I never understood, a lei of flowers. "All right, girls, it's gonna be a big day!" he enthused. Teenage squeals filled the air. "You're gonna be mine for the next 12 hours..." And then he tried to say something about Marineland, a recording studio (where Micky Dolenz would make an appearance), a theater (where we would see outtakes of the Monkees' television series), and a pizza and spaghetti dinner – but no one could hear him for the screaming. Then we all calmed down and climbed aboard a private motor coach. At Marineland, the first stop, Davy was in his element. Porpoises jumped at a Monkee's command. He smiled, and the sun shone brighter. But though the fan magazine Tiger Beat would later report that Davy "thought the girls were loads of fun every minute," I had my doubts. He spent more time cracking jokes with his handlers than he did with us. "Davy!" called the Phoenix winner, holding up the mic of her tape recorder, "Say something for everyone in Arizona!" "Something for everyone in Arizona," came Davy's reply. As luck had it, Ken the DJ had known Davy years before in England. Later at the hotel, as each girl scooted close to him on the lobby couch for a souvenir photo, Davy and Ken renewed their acquaintance, and Ken smuggled me past my dagger-eyed companions for an after-hours Monkee tryst, albeit a journalistic one: A one-on-one interview for my school paper. In private, Davy was, by comparison, the picture of monk-like contemplation. Yes, he enjoyed having his own contest but, "The thing we have going for us is that when we're on that stage, we are as one." Of course, time was ticking down on that one. The series was canceled the following year, Peter Tork and Mike Neismith soon exited the group, and by the dawn of the Seventies, the Monkees were headed for the cutout racks. But Davy and I had one last hook-up. In the early Eighties, I was a partner in a tiny radio production company, where I had the great Brenda Lee under contract. One afternoon, I answered the phone to find Davy Jones and Tommy Boyce, the co-writer of many of the Monkees' hits, on the line. Davy explained that both he and Brenda were popular in Japan, as much for their diminutive height as their talent. 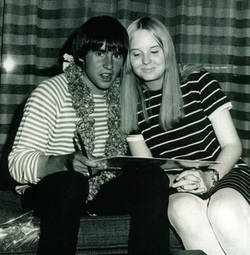 Tommy, who was living in Nashville, mentioned that the former Monkee was between gigs, and thought that Davy and Little Miss Dynamite might make ideal duet partners. Could I, as the producer of "Brenda Lee's Country Profile," arrange an introduction? Davy hadn't realized he was chatting with a woman he'd once snuggled close to on a hotel sofa, and he chuckled when "Stephanie" recalled the moment. But unfortunately, his date with Brenda led to no more than our own had 15 years earlier, when fishnets were the first word in mod, and the Monkees seemed poised to rule the world.